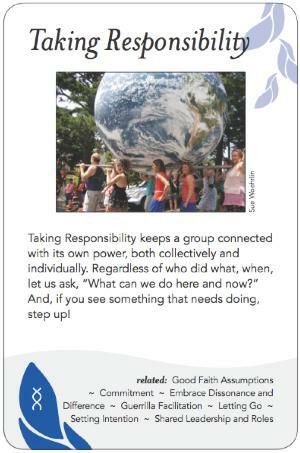 Taking Responsibility keeps a group connected with its own power, both collectively and individually. Regardless of who did what, when, let us ask, "What can we do here and now?" And, if you see something that needs doing, step up! The human tendency to place the source of difficulties outside ourselves is strong. This happens on both the individual level (blaming others in the group) and the group level (blaming those outside the group when things go awry). Doing that is disempowering--instead, we can choose to claim responsibility for whatever our part is in the situation. Doing this helps prevent theorizing and grandstanding, and encourages teamwork. Both conveying the concept and doing practices to live out that concept can be done in many different ways. The use of "I" statements (replacing, for example, "You made me angry," with "When you did X specific thing, i felt angry") has been popularized in recent years as one method, and some groups adopt a ground rule to this effect. one or more participants asking, "What can we do?" or "How can i make a difference here?" This doesn't mean we can't discuss surrounding conditions, circumstances, or beliefs. However as we do so we must remember that it is our attitude, beliefs, values, and actions that we can affect, not those out there. If we do change the world it will be by who we are being as we take action. There can also be a danger in "over-functioning": Taking sole responsibility, needing to do it all yourself, thus leading to martyrdom and/or disempowerment in others. The "law of two feet" from Open Space invites people to move and change sessions if they aren't teaching, learning, or feeling fulfilled. In the course of Tree Bressen's intensive facilitation series in BC, Canada, participants during a session at WindSong Cohousing answered the following two questions in front of their neighbors: "I give up my power when I..." and "I can choose to reclaim my power by..." It was a powerful moment of turning away from blaming or scapegoating others for their dissatisfaction and turning instead toward positive shift in themselves and their community. Friedman, Edwin H. (1985). Generation to Generation: Family Process in Church and Synagogue. USA: Guilford Press. Gilbert, Roberta M. (1992). Extraordinary Relationships: A New Way of Thinking About Human Interactions. USA: Wiley. Meme: Taking personal responsibility helps satisfy the need for personal efficacy identified in Positive Psychology and the Orange meme needs identified in Spiral Dynamics.